Udai Raj Hindu Inter College, Kashipur, Udham Singh Nagar has released notification for the recruitment of Teachers (LT) for the academic session of 2015-16. Udai Raj Hindu Inter College Kashipur invites eligible candidates for various teaching posts of Assistant Teacher (LT). 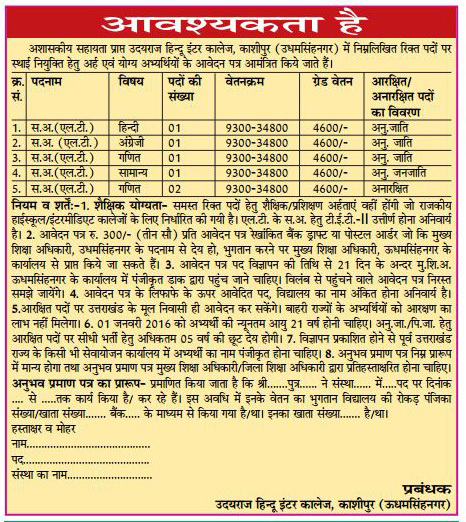 Candidates should be BEd and TET 2 passed and registered in Employment office in Uttarakhand. Selection of candidates will be based on their experience and interview performance. Candidates can get application form by giving Cross Postal Order/ Bank Draft of Rs 300/- in the name of Chief Education Officer, Udham Singh Nagar from the office of CEO, Udham Singh Nagar. Candidates have to submit the application form with all testimonials and employment registration card to Office of Chief Education Officer, Udham Singh Nagar by registered post till 18 July 2016. Help us to improve this article/job posting "Teachers Recruitment in Udai Raj Hindu Inter College Kashipur". We would be glad if you can comment below and provide your valuable suggestions and feedback. If this page have any wrong information/list or out of context content, then you can report us as well. Respected sir,, female can apply or not for the post of teacher…. What is its advertise number?